Apple reportedly has lost market share in the U.S., its largest market. NEW YORK ( TheStreet) -- The times, they are a changin'. The great Bob Dylan wrote that, and while the song wasn't about Apple ( AAPL - Get Report), it's certainly applicable now. 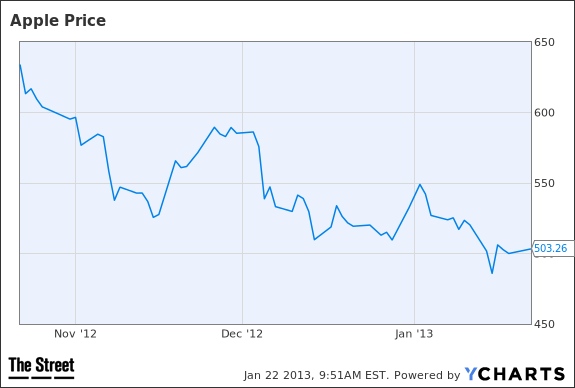 Prior to the last three months of 2012, Apple could seemingly do no wrong. Everyone loved its products, the stock price appreciated at a strong pace with some bumps along the way, and if you took jabs at the company, its stock or its products, you were crucified. That has all changed in recent months, and it may be reflecting a waning interest in the company's products if you believe research firms. Shares of Apple have fallen over 20% over the past three months. Research firm Kantar Worldpanel is out with a note that showed while Apple has over 50% market share in the United States, with 51.2% as of the end of Dec. 23, that's down from 53.3% as of Nov. 25, and perhaps a growing concern that Apple products are growing stale. Kantar Worldpanel ComTech analyst Mary-Ann Parlato doesn't see it this way, noting that more than 30% of iOS sales came from other smartphones users in the past year. "In particular, 36% of iOS sales were derived from other smartphone users over the last year. While this figure remains stable over time, the proportion of Android users moving towards the Apple brand increases. 19% of iOS sales over the last year were derived from Android users, compared to 9% in 2011," Parlato said in the statement. She attributed this to both strong sales of the iPhone 5, as well as older models attracting customers. Still, it's important to note that market share slipped nearly more than 2%, with Google's ( GOOG - Get Report) Android operating system seeing an increase, moving from 44.2% to 44.8% market share in the United States. Another gainer was Microsoft's ( MSFT - Get Report) Windows phone, which moved up from 2.2% to 2.6%, though vastly behind both Apple and Google in market share. Apple iPad Demand: What's the Real Story? Apple is set to report fiscal first-quarter earnings Wednesday after the close of trading. Analysts polled by Thomson Reuters expect Apple to earn $13.43 per share on $54.7 billion in revenue for the holiday quarter. There have been plenty of questions about demand for Apple products, with seemingly endless reports and market share analysis about demand falling. The proof is not in the pudding though. Actual results from Verizon ( VZ and AT&T ( T are painting a different picture. During Verizon's fourth-quarter earnings call, the company noted 6.2 million iPhones were activated during the quarter, with half of them being the iPhone 5 version. Last week, AT&T said it activated 10.2 million smartphones, and while it didn't break out iPhone numbers many expect it to be in the 80% range. AT&T reports earnings later this week. Demand for Apple products doesn't appear to be slowing down when looking at hard facts. While some consumers may be getting tired of the constant product refreshes, or are just looking for the "next best thing," judging by results of the telecoms, analysis of Wall Street research firms, and my own intuition, Apple is not losing its luster. Not by a long shot.